Is Elizabeth Woodville Philippa Gregory’s Apology to Anne Boleyn? In “Having it All in the Fifteenth Century” I looked at the first episode of BBC/Starz’ “The White Queen” as a 21st century fantasy played out through the ever-flexible genre of the historical drama. In the world of Elizabeth Woodville the would-be rapists turn out to be tender royal husbands, mom and dad tease each other affectionately across the dinner table, and family ambitions never descend into ruthless scheming. A little white magic, yes—but no evil motives. Family life is as cozily domestic as in a Jane Austen novel, as Jacquetta (Janet McTeer) delightedly plans which daughter should marry which royal prospect and Baron Rivers (Robert Pugh) looks on with tolerant amusement. Its every girl’s dream family—supportive mom, loving dad, protective brothers. It could even get kind of boring, were it not for the Woodville’s enemies: Lord Warwick (James Frain), who I’m sure would be in a better mood after a decent shave (preferably by Sweeney Todd), and Margaret Beaufort (Amanda Hale, an attractive actress elsewhere, here she reminds me Margaret Hamilton as the wicked witch of the west in Wizard of Oz.) Even at this early stage, Beaufort is beginning to look as though she needs to be locked up in the attic, providing no little support to Kyra Kramer’s theory that Henry VIII’s personality problems were genetic. This world of fairytale heroines and plotting relatives is the stuff of archetypal pleasure, as delicious as a bedtime story and a nice escape from the complexity of real life, where the villains are often clean-shaven and the rapists are rarely marriage material. It’s also, as I suggested in “Having It All in the Fifteenth Century,” very much a female fantasy—unlike “The Tudors,” for example, a much better written show, but one whose creator and head-writer Michael Hirst had to be poked and prodded by Natalie Dormer to turn Anne Boleyn into someone with whom women could identify. 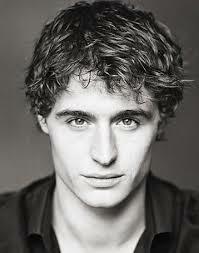 Watching episode two, I was especially struck by how much Edward IV-as-dream-husband (at least at this point in the series) seemed to be constructed as the very opposite of Henry VIII in “The Tudors,” whose tenderness toward Anne declines steeply once he’s caught her, and plunges disastrously when the desired male heir does not appear. Of course, “The Tudors” is not alone in this—for this is the story countless historians, novelists, and film-makers have told about Henry and Anne’s post-marriage relationship, basing their narratives largely on the not-exactly neutral reports of Eustace Chapuys. In fact, we don’t know much more about Anne and Henry’s intimate life together than we do about Elizabeth Woodville’s and Edward’s—except that Elizabeth and Edward produced many children and had a long life together, and Anne and Henry…. well, we all know how that ended. In between the beginnings and endings of both relationships, the cultural imagination, wending its way through different eras and different agendas, has filled in the dots according to fantasy and fable. The story of Queen Elizabeth’s birth, for example, although challenged by the most responsible historians, almost always has the Henry bitterly disappointed and beginning to simmer with anger at the birth of a girl. Edward’s reaction, in “The White Queen” is virtually the mirror image. Presented with his firstborn girl, the briefest flicker of disappointment crosses his face. But he is quick to reassure Elizabeth, drenched with sweat and anxiously promising him that the next will be a boy, “You’re so lovely; I cannot do without you,” as he lovingly nuzzles the baby. The next scene, meant to be three years later, shows Elizabeth happily herding three little daughters through court and field. And Edward’s tender love for his wife (you can tell from the sincerity of his kisses) has clearly not abated, despite the fact that her womb had yet to prove itself heir-friendly. 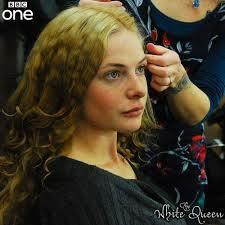 Elizabeth’s life (in “The White Queen”) would be envied by Anne Boleyn (in “The Tudors”) in other ways, too. In “The Tudors” Anne is coldly manipulated and used as a sexual lure for her father’s ambitions. 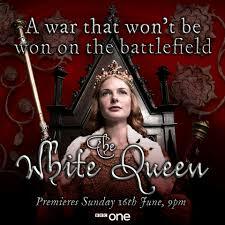 In “The White Queen” it is Jacquetta who is the ambitious one, but protectively, like a mother hen, with her daughter’s future in mind and never at the expense of Elizabeth’s honor or agency. Baron Rivers, on his part, is just a big cuddle-bunny: “You’ll always be my Elizabeth,” he tells his daughter more than once, before he is cruelly eliminated by Warwick. Papa Boleyn, in contrast, remains cowardly and coldly detached as his own children are put to death. 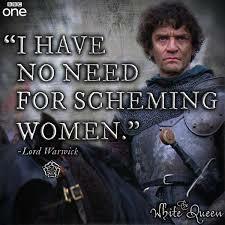 Of course, there will be scheming women. What fairy-tale can do without them? But for the time being, at least, Elizabeth, adoring husband by her side, rules. Ah, Anne, would that you had been so lucky.